These are the exact words of declaration given by Andrea Biondo, the reigning Mister Universal Ambassador Philippines during his official send-off party and press conference on September 16 at Icon Hotel in Quezon City. The 23-year old Half-Filipino and Half Italian gentleman will represent the country in the upcoming Mister Universal Ambassador 2016 in Surabaya, Indonesia this coming September 30. During the send-off press conference, Biondo said that he is very excited to compete and to travel to Indonesia. “I love to travel and I will bring home the crown”, he declared. “I don’t want to be Christian Ortiz (the reigning Mister Universal). I want to be myself. Being me and being confident, that will make me a winner”, Biondo answered when he is being compared to the reigning Mister Universal Ambassador. The Public Relations Head of Gentlemen of the Philippines Organization (GCI), Norman Tinio, said that he is very positive for the outcome of the upcoming pageant. “I can tell that he wants to win. He is not vocal in saying but deep inside he wants to win. He will give his best and he will win”, Tinio added. In a press statement, GCI said that they made sure all bases are covered- from wardrobe to talent, Heart of Ambassador Project, interview training, TV/radio guesting, media interviews and fitness regimen. During the send-off party, GCI also presented the National Costume that Biondo will be presenting. 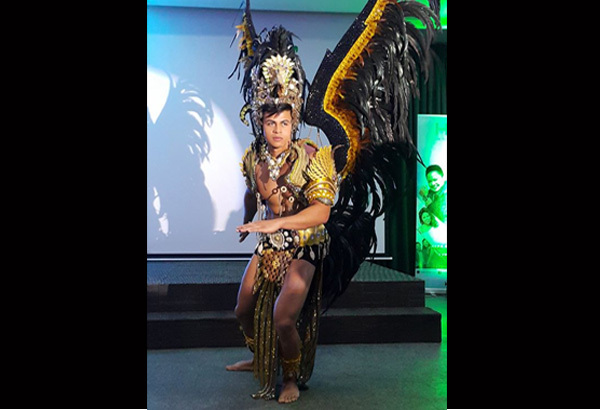 It’s a “sarimanok”-inspired national costume designed by Nick Guarino, a fashion designer from Tacloban, Leyte. In an interview, Guarino shared that it only took him three days to create and complete the outfit. Now on its second year, Mister Universal Ambassador is considered the biggest international male pageant yet. There will be sixty-four (64) confirmed candidates competing for the title. The current titleholder is Christian Ortiz of Puerto Rico.